If you are a Premium Plus or Pro broadcaster it's possible to switch the audio quality of your stream. Click the red 'SQ' button on the app to bring up the menu. 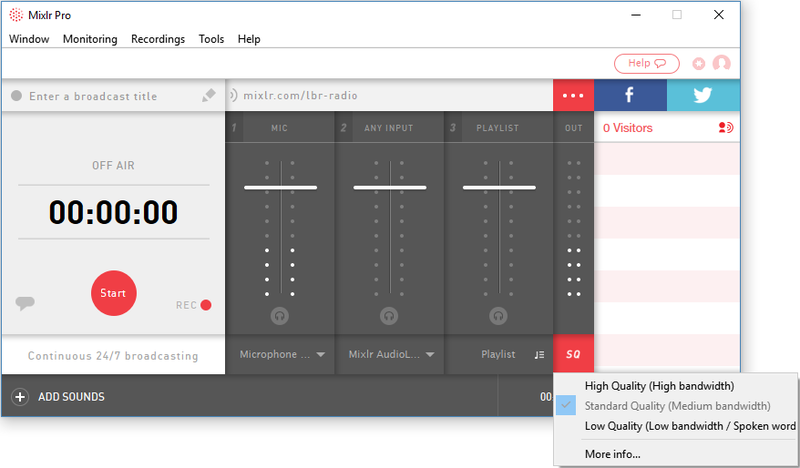 This will bring up the audio quality menu, from where you can switch between High Quality, Standard Quality and Low Quality. By default, Standard Quality will be selected. 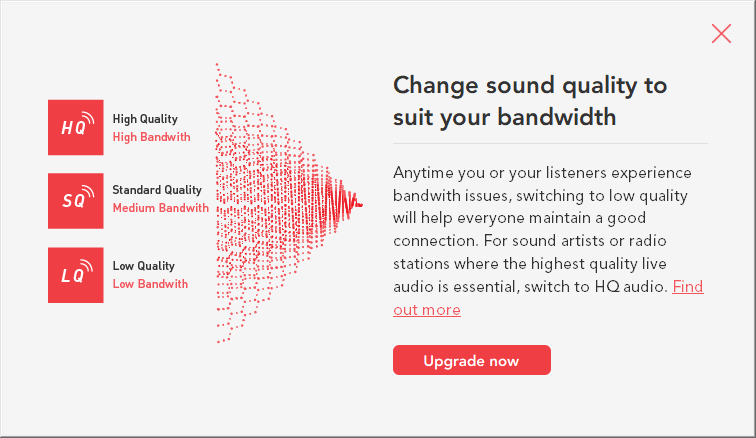 If you're a musician, band or radio station then you may prefer to increase the audio quality of your stream, to ensure that your listeners get the best possible quality audio delivered to them. On the other hand, if your live broadcasts are mainly spoken word, or audio quality is unimportant to you, then decreasing audio quality actually lowers the amount of network bandwidth required by your listeners. This can lead to better listening experiences, especially on for listeners slow or mobile connections. If you're unsure, sticking with the default audio quality setting is usually a good bet. Does this affect my recordings? No - it only affects the live stream. Why can't I switch audio quality through the 'SQ' button? Switching audio quality is a feature that's currently only available on the Premium Plus and Pro plans, so if you're a Premium user you will see the below pop up box if you click the 'SQ' button. You can upgrade to Premium Plus or Pro here.